In a previous post, I talked about my attempt to capture and/or create a meme. I have blogged elsewhere how I was fascinated with the fast-pasted meme of the New England earthquake on 10/16/2012. 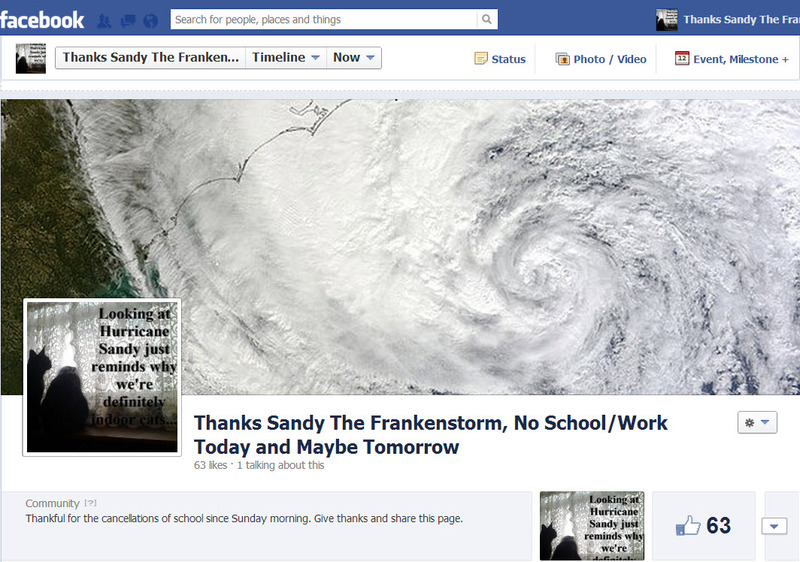 As Hurricane Sandy soon descended upon New England, I set out to see if I could mimic what I survived the 10/16/12 earthquake Facebook page did with a page of my own: Thanks Sandy The Frankenstorm, No School/Work Today and Maybe Tomorrow. Much of my work and thoughts around this was inspired by Bill Wasik's And Then There's This, a great book about the nature of memes. How did it go? Meh. Not great but interestingly nonetheless and I learned some interesting things that are useful in this regard. My observations and thoughts are as such. It reached 67 likes at its height. What made the earthquake enjoyable and amusing was that it was done and over with before most people knew about it and did very little in terms of actual damage to humans and buildings alike. Some are likely to have heard of the Facebook page before the actual earthquake. Thus what was a potentially cataclysmic event was largely amusing. By contrast, I took on something that was still ongoing and was actually life-threatening (death toll was over 100 last I checked) and did serious damage to many parts of the Eastern coast. It was poor judgment to be bemusing the storm that was having serious effects. No one actually called me on this one surprisingly, but in hindsight, clearly, I missed that piece. Thus in the future, I'm likely to tread a bit more lightly and think more big-picture. Google + & circles: I posted regularly similar posts like those for Twitter on my Google+ accounts. Other Sandy Facebook Pages: I joined other Hurricane Sandy pages and encouraged them to join us and also would often share their posts with my group. Blog: I wrote the aforementioned posts and it too served as a launching point. 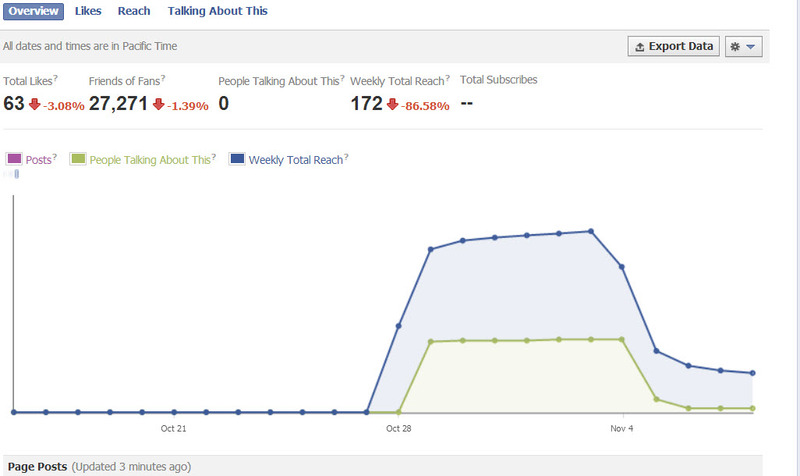 What I saw on other Sandy pages that I didn't do as well was post useful information and updates. Though at one point I did post links to state by state school closings, but that was largely irrelevant--fitting with the page but actually generating much interaction. In hindsight though, I think if I were making an information-related timely site, I could see pulling in a great deal of internet resources to provide timely information to the fans of the page. That seems a useful lesson to consider; how to be timely and relevant for the page-fans. In order for the word to spread, there needs to be interaction on the page. I did this sporadically in bursts, so there would be a bunch of posts and then nothing for hours. A more regulated amount of interaction would do better. I also should have regularly created more interesting images to post. Rather than sharing them from other places, I needed to do more than share content; I needed to make and post content. Many know that watching numbers can be a rather addicting trap. Hitting refresh and seeing what's changed. I remember the first time I fell into this trap was the Donate count on Amazon.com's website days after 9/11. It just kept growing and growing. My numbers didn't but I still kept looking. It's important to look at the numbers, but might have been more useful to do so less actively. The numbers can show you a lot. 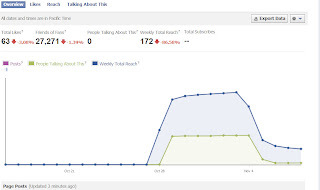 Digital analytics on facebook and google are pretty good at showing you what's going on. They're important; but don't obsess over them. The rush in my excitement about doing it meant I didn't step back and reflect a bit more substantially about how to go about it. There are a variety of things I could have planned better with (including the things above). I think even if I gave it an extra two hours of strategy, I could have captured more interaction and had a clearer purpose. However, my attempt to launch first and think later just meant I didn't think all that much. In the end, more strategy to develop a clearer message and plan, coupled with consciously producing content and fostering relations with out social media are key take aways. I peaked at about 67 users (31 of which were friends of mine) and that was only through borderline spamming which tells me it didn't catch any viral waive but just overexposure from me. Thoughts about education: I think meme-making would an interesting tool for learning. Organizing and orchestrating a campaign around a concept (I'm The Real Shakespeare; Science Will Make Me a Superhero, Environment-The Only Thing We Have to Protect Us From Aliens) and pushing students to make it catch on could be an interesting challenge that encourages them to get invested in material and use it as a means to connect with other people through social media. I think that just might be my next experiment!